SVP 310 : flexible products. The SVP310 is Seleco's entry level CRT projector maintains the ease of use and flexibility. It is equipped with a multistandard video decoder (PAL, SECAM, NTSC 3.58 and NTSC 4.43) It is a quality projector, featuring a screen dimension of up to 250" diagonal (5 metre width), at an affordable price. The SVP310 has a power jack with a 12 volt DC output supply, that is active only when the projector is ON, for driving a motorised screen or switching off the room lights. 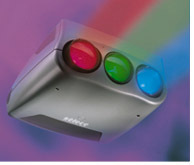 All videoprojectors are equipped with remote control and bracket for ceiling mounting.